Myelopathy is a term used to describe any neurologic deficit related to the spinal cord. It’s usually due to compression of the spinal cord by osteophyte or extruded disc material. It is most commonly localized in the cervical spine but it can also occur in the thoracic and lumbar spine. There are many primary infectious, inflammatory, neurodegenerative, neoplastic vascular, idiopathic and nutritional disorders that results in myelopathy. These causes are much less common than disco genic diseases, metastases or trauma. Further explanations will be given in the following paragraphs. To determine the grade of severity of the myelopathy you can use the Nurick classification. The classification is based on abnormalities in the patient’s gait. This evaluation has demonstrated its sensitivity and validity. The diagnosis of myelopathy depends on the neurological localization in the spinal cord, rather than the brain or peripheral nervous system. Also, the presence or absence of significant pain or trauma and the mode of onset is primordial to assess the myelopathy into clinical categories. The spinal column begins in the cervical region under the skull. It continues into the thoracic region and finally into the lower back where it connects to the sacrum and pelvis. The cervical region consists of 7 vertebrae, the thoracic region of 12 vertebrae and the lumbar region of 5 vertebrae. Between the corpus and the process of the vertebrae is the spinal canal. It’s a region in the middle of the spine where the spinal cord goes down and nerves travel toward the extremities. The brain and the spinal cord are packed in 3 membranes: dura mater, arachnoid mater and pia mater. Each one has their own structure and function. Even though the spinal cord is well protected, it can be damaged by epidural or intradural causes. This is what’s happens when we’re talking about myelopathy. Myelopathy can sometimes be a slow process. The symptoms can develop slowly over a period of months or it can go very fast. It’s difficult to clinically distinguish myelopathy from other non-traumatic causes of myelopathy because the classic history is frequently absent or difficult to elicit from a seriously ill patient. There are many risk factors that may cause or occur thoracic myelopathy. Degrees of spinal cord compression, absence of proximal stenosis and intramedullary hypertension this factors predicted the surgical outcome. It can be difficult to diagnose myelopathy because the clinical presentations are variable and sometimes like those of other disorders. That’s why it’s important to have a thorough history and complete physical examination of the patient. In this case, it is very difficult to know which symptoms appear by myelopathy or to the mediated disorders. Diagnosis of myelopathy depends on the neurologic localization. Imaging of the myelopathy is crucial. This can show a reduced spinal cord diameter or abnormalities in the cord and hypertension in the central cord. Diagnosis of myelopathy rest on demonstration of mechanical stability of the spine. We should note that MRI is considered as the golden standard to diagnose myelopathy. Physical examination results commonly in long tract signs such as spasticity, hyperreflexia and abnormal reflexes. Hoffmann, Babinski, and clonus are frequently tested reflexes. Someone with myelopathy has a positive Hoffman and/or Babinski and/or clonus test. We also frequently notice progressive deterioration in their hand and gait function. So, it can be useful to examine the gait cycle of the patient with a toe-to-heel walk and the Romberg test. Myelopathy leads to generalized weakness and intrinsic muscle wasting. That’s why it’s also important to test some muscles with tests such as the Finger escape sign or the Rapid grip and release test. The Japanese Orthopaedic Association scale can help us to assess the severity of clinical symptoms in patients with myelopathy. It consists of 6 scales (motor dysfunction in upper extremities, motor dysfunction in the lower extremities, sensory function in the upper extremities, sensory function in the trunk, sensory function in the lower extremities and bladder function) based on motor and sensory functions which are individually graded with a maximal score of 17. We should note that there exists a modified Japanese Orthopaedic Association score used in Europe. The two scores showed a good correlation with each other in terms of their total scores and recovery rates. More specific information about physical examination for cervical myelopathy can be read on this page. Conservative management, such as physical therapy, cervical immobilisation or anti-inflammatory medication is preferred. But when patients have intractable pain or progressive neurological symptoms surgical interventions are needed. As we mentioned above myelopathy is usually due to compression. When surgical intervention is needed, we will focus on decompression of the spinal cord and nerve roots. Deformity prevention by maintaining or supplementing spinal stability will be another goal of this intervention.There are many techniques describes decompressing the spinal cord and roots which can be anterior, posterior focus circumferential. The choice of the most effective technique is dependent on numerous factors such as location, comborbidity, stability of spinal column and surgeon’s experience. When we look at to the differences between anterior and posterior laminectomy in patients with cervical spondylotic myelopathy, we see that there are none concerning the health-related outcome measurements. We do see that the anterior approach is more often used in younger patient weer the myelopathy is less severe. When we look at compressive myelopathy, at first we see that lumbar spine stenosis can be a risk factor. Secondly, we see that metastatic compression of the spinal cord can occur in myelopathy. Lumbar spinal stenosis can be treated conservatively with use of medications which will focus on increasing the blood vessel diameter and with this the blood flow. This because the diameter of the blood vessels in the cauda equina in LSS patiënts is significantly smaller than the diameter of blood vessels in healthy individuals. Medication : vitamins, NSAID’s, muscle relaxants and prostaglandines. 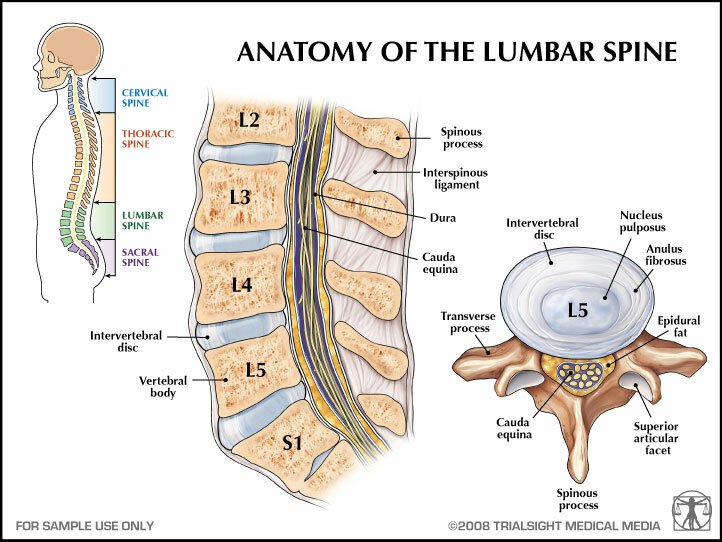 Lumbar spinal stenosis can be treated surgically by the decompressive mild procedure. This is a minimally invasive procedure in which they will remove part of the posterior fibers of the hypertrophic ligamentum flavum and some interlaminar bone while maintaining anatomy, stability and biomechanics of the lumbar spine. When the mild procedure is used, there is a continuous epidurographic lateral oblique fluoroscopic imaging. A surgical intervention is performed to preserve neurological function and pain and will improve median survival rates for at least 6 months. Post-operative complications are respiratory complications, deep venous thrombosis, pulmonary embolism, cerebrospinal fluid leak and wound infection. As we know many causes can result in myelopathy. This is why it’s difficult to treat a myelopathy. Before we treat the myelopathy we have to have an idea about the etiology. It has also been reported that symptoms of mild myelopathy have been improved by conservative treatment in a high ratio of patients. Also, continuous traction of the spine improves myelopathy symptoms. On the information based on a case report, physical therapy can achieve satisfactory results in patients with spondylotic myelopathy. Unfortunately, the complete reduction in symptoms was not achieved. It’s reported that in the initial phase manual therapy techniques can be employed to reduced pain. The goal of the therapy is to give some space. So extension and rotation at the painful level can be useful. Hypothesis have been raised to explain the reduced pain and the improved function achieved with manual therapy. In a second phase, manual therapy can be necessary but is not the main part of the therapy. This phase consisted of dynamic upper and lower limb exercises and functional or primitive diagonals of PNF for the upper and lower limbs. The PNF is needed only when the patient shows signs of paresthesia. Another study reported that we have to note that the number of patients undergoing conservative treatment for spondylotic myelopathy is decreasing because of the improvement in recent surgical results. This study performed continuous traction by the Good-Samaritan method of the spine if patient desired it. It was performed for 3-4 hours daily. This was in combination with drug therapy and exercise therapy. Conservative treatment for CSM is considered to be effective if it is performed intensively selected patients. When we look at the effects of physical therapy pre –and post-surgical to patients with degenerative lumbar disorders, we see that there is little evidence to describe the physical therapy that is used. Some researchers suggest that when early rehabilitation and early exercise are given post-operative, the patient will resume work activity, are discharged earlier from hospitalization and reach some of the measured post-operative milestones earlier. Due to many different kinds of myelopathy, it is important to know the specific cause of myelopathy so treatment can be chosen carefully. There is a variety of surgical procedures that can be used for the treatment of myelopathy. when we look at the physical therapy management of myelopathy we see that there is no sufficient evidence for concluding whether and which physical therapy is best to use in these cases.